ASD or Autism Spectrum Disorder is a condition I never thought I would come across in my own family. I remember watching a movie titled Ipagpatawad Mo starring Vilma Santos and Christopher De Leon where their son, Jun-Jun had Autism and would totally be in a world or his own. That's how I understood Autism - a condition where the person affected is in a world of their own and does not interact at all. I was mislead all these years. I was told that my little boss may have Autism but then I refused to believe so. I believed that he was just "delayed". He rolled over at 3 months, sat up by 4 months, started walking at 8 months and I believed he was advanced. Until he reached 3, he then would stack toys, play with the light switch, place his fingers in his ears when there were loud noises. I then read an article written by SJ of All-Around Pinay Mama - I suddenly became aware and I knew that my little boss had Autism. It took us more than 6 months to get a check up with a Developmental Pediatrician just because of finances and my fear that we couldn't afford therapy. 2 weeks ago, we finally got that check up and I cried after getting an appointment because I was happy that my little boss would finally get what he needed. I have heard and read all the stories about the struggle of getting an appointment, the hefty fee needing to pay and the unsatisfactory service. I knew God made a way for us to get this slot and it was with perfect timing. I had just come from a leave and we were financially able since the fee was surprisingly low (based on on others feedback). The Developmental Pediatrician diagnosed my little boss as behind with all skills except for loco motor. His speech was the most delayed being diagnosed with a speech skill of a 12 month old. 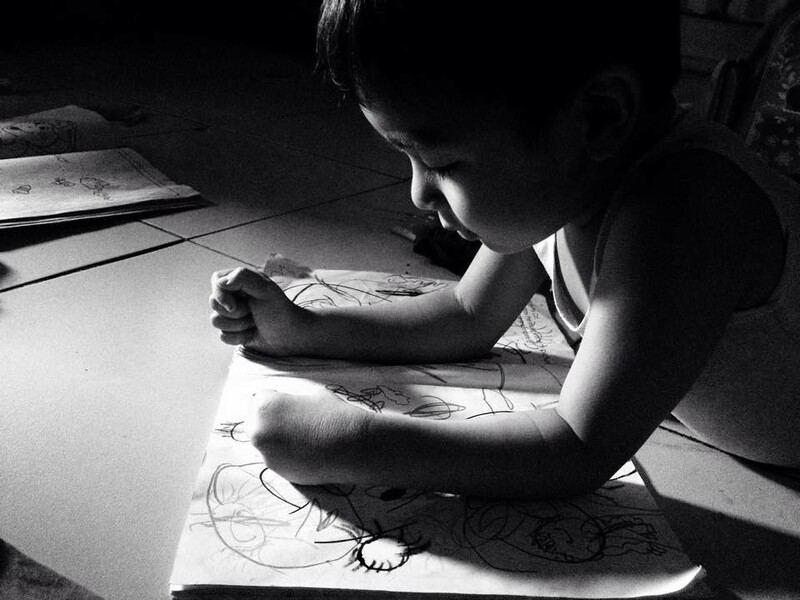 He loves to draw, we sometimes think this may be his outlet. My heart broke despite me knowing already what the diagnosis would be. I asked myself, Where did I go wrong?, Am I a bad mother?, What did I do to cause this? I am starting to accept that I need to stop looking for the reason and start acting to help him cope with his condition. So far, we are applying for a scholarship at a nearby therapy center and we will get the results after a month. I know that this will not be easy for him but I am praying that he will improve soon and hopefully be able to guide him through his therapy. I know I would be needing support and moms who experience the same thing need enlightening, so I created a group specifically for Moms that have kids on the Autism Spectrum. If you are would like to join please do so at Moms of Autism Angels and let's share thoughts, challenges and triumphs. Thank you Mayu! From one of the strongest moms I know! Thanks you Camille. Love love! Hugs, Marie! Our family and sons can with the support and love of our friends and relatives and of course, with the grace and guidance of the Almighty. After continuous therapy, you'll see his improvement. Just believe and have faith, Sis.